First posted as an alleged erratum. 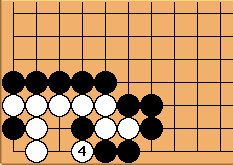 Black is the vital point of White's eye shape. If White , Black links up with . ... continuing from Diagram 1, White sacrifices a stone at , placing Black in a shortage of liberties. 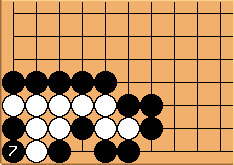 If , capturing the White sacrifice stone, White plays , threatening to capture either two Black stones or four Black stones. Thereby forming two eyes. Unfortunately, the alleged erratum is an erratum in itself. had in fact placed the entire White group in self-atari, so can capture the entire White group. The irony of it is that it is White that suffers from shortage of liberties (because White cannot play at ), not Black suffering from shortage of liberties as stated in the alleged erratum.